You only have to watch a TV show in which the camera flies over any major city to realize the numbers of ugly, stark, gray, flat roofs that occupy millions of square feet but contribute nothing to the environment. It’s almost an ‘out of sight, out of mind’ attitude we have with these unoccupied spaces. But what if we could turn these wasted environments into something beneficial to the environment, while at the same time beautifying the tops of our tall buildings and skyscrapers? ‘Green roofs’- urban rooftops covered with plants - are gaining in popularity to help buildings reduce their reliance on air conditioning, and now scientists in Michigan are reporting they could also help fight global warming by eliminating carbon dioxide in cities, more effectively than was first thought. Previous studies have indicated that painting roofs white can be a low tech way to reduce global warming by reflecting the sun's rays back into space and Prof Steven Chu, the U.S. Energy Secretary, has been heralding the idea. 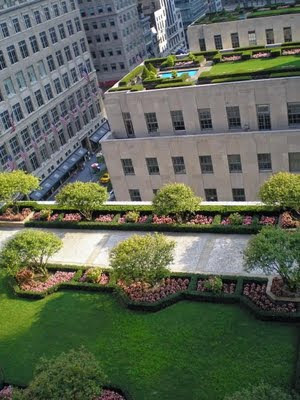 Now researchers have attempted to quantify the benefits of covering urban rooftops with plants. The scientists found that replacing traditional roofing materials with ‘green’ in an urban area the size of Detroit with a population of about one-million, would be equivalent to eliminating a year's worth of carbon dioxide emitted by 10,000 mid-sized SUVs and trucks. Their study is the first to examine the ability of green roofs to sequester carbon that may impact climate change and the findings are scheduled to appear in the journal Environmental Science & Technology. While many researchers understood that green roofs were multi-functional because of their ability to reduce heating and air conditioning costs, detain stormwater and absorb carbon dioxide, it wasn’t until Kristin Getter and his colleagues’ new study that anyone knew how big a positive impact green roofs could have on reducing green house gases, which contribute to global warming. The scientists measured carbon levels in plant and soil samples collected from 13 green roofs in Michigan and Maryland over a two-year period and found that green roofing an urban area of about one million people would capture more than 55,000 tons of carbon, or the same effect as removing more than 10,000 mid-sized SUVs or trucks off the road a year. Imagine how much more carbon dioxide could be removed if urban environmentalists and town planners incorporated vertical landscaping into their the cities.